The demonstration was followed by a public meeting held at Peliyagoda New Town Hall. Tamil National Alliance (TNA) parliamentarian Sivajilingam, Tamil Congress Leader Vinayagamoorthy, Western Peoples Front's Piraba Ganeshan, senior member, and several others participated in the demonstration. 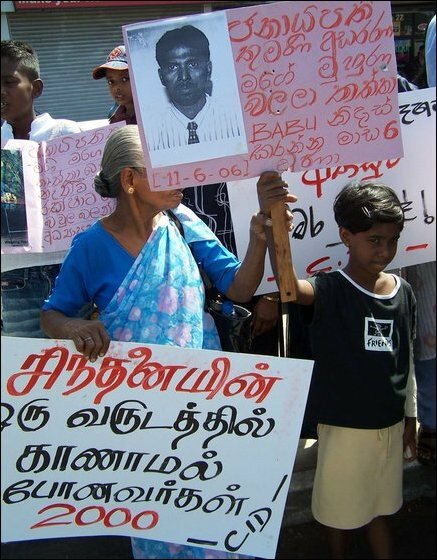 The relatives of the abducted from Sinhalese, Tamils and Muslima participated in the demonstration voicing slogans and carrying placards demanding the Sri Lanka government to free the abducted. 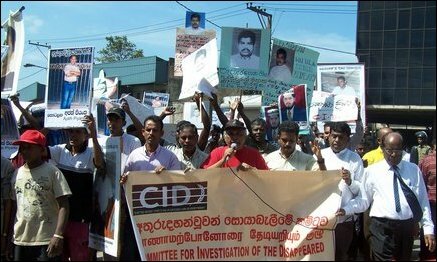 The placards accused the Sri Lanka Government as responsible for the abductions. 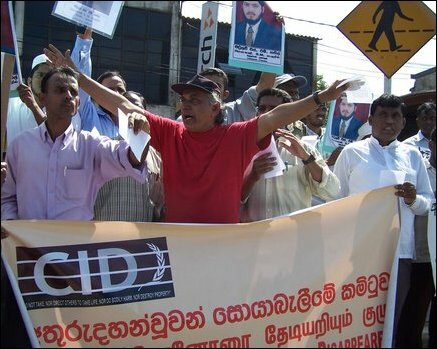 "Our friend and Tamil parliamentarian Raviraj, who fought with us to free the abducted in demonstrations like this was assassinated in Colombo which is under the full control of the government security forces. The government is answerable and should take full responsibility for this assassination," Wickremabahu Karunaratne said in his speech. "We will continue to demonstrate against the abductions until the abductions are stopped and people are able to live without the fear," he added. Sivajilingam, representing the TNA and Vinayagamoorthy from the Tamil Congress party addressed the meeting at the New Town Hall which ended around 12:30 p.m.